Get exclusive access to insider coaching, training and support — to shorten your corporate learning curve, accelerate your success, and navigate your workplace with unshakeable confidence. You're talented. You're smart. You're dedicated. And you've worked damn hard to get where you are today. You have questions. Lots of them. How do I negotiate a better salary and employment package? How can I position myself for opportunities that excite me? How can I build real relationships with mentors and peers? How can I make more of an impact at work and feel confident in what I bring to the table? Maybe you have access to senior leaders and executives, but you don't know how to get on their radar (or what to say when you do). Perhaps you've connected with potential mentors… but you have no idea how to follow up, and how you can use their support to your advantage without feeling skeezy. Maybe you've just experienced a big win in your career, but you don't feel as successful as you thought you would… and you're unsure of what your next move should look like. And sometimes — you need support. Feeling like you need to constantly check yourself to fit in: speak more softly, smile more often, filter your words to make sure they're acceptable to whoever is listening. Struggling to capture meaningful feedback from your supervisor while working with people that think, see and experience the world differently than you do. A general sense of distrust that you carry around with you each day, and the never-ending struggle with C-Y-A and documentation required to manage how you're perceived at work. Not knowing how to speak up about something that's not right without being stereotyped as angry or aggressive (and putting a target on your back with your manager or HR). Being unsure of how to find mentors to guide you and sponsors who will advocate for you when you're not in the room. And, when it gets really bad? It's being passed over for that promotion you worked yourself into the ground for (or scoring the promotion... only to be told a raise is off the table). It's navigating an outwardly hostile workplace, difficult coworkers and near-impossible workloads while devastating things are happening in your community — and feeling like nobody gives a damn. It's being in crisis, barely treading water at work and waking up every morning feeling sick to your stomach… with no idea who you can talk to, who you can trust, or where to turn for advice. You're not alone if you've ever felt like you stick out in any room — yet your accomplishments and talents go unseen. It's exhausting. Isolating. Crazy-making. And hard as hell. Stay with me here — because things are about to get a whole lot better. I know you've asked yourself at least once before: "Is it worth it?" Because I've been there too. And I know you're already intimately familiar with the impact that bias can have on your earning potential, opportunities for advancement — and your sanity. I know how it feels to be on the outside looking in: when your emails go ignored, your ideas are unacknowledged, and your name conveniently falls off the invitation list for a key meeting — and you wonder whether you’re the only one who really sees what's going on. And even when things are going well, there are still days when you wonder whether your colleagues are from a different planet. And it feels like the burden of bridging the gap is always on you. Exhausting. Especially when you've also got a job to do. It's not right. You aren't crazy. And it's not your fault. You can get what you want and need from your workplace — like meaningful feedback, real progression and a paycheck to match — without dimming your light or compromising on your values. You can learn to build career-changing relationships and connect with powerful mentors, even if the idea of traditional networking has you hiding under your desk (I see you, introvert — and I've got you). You can make moves to paint a powerful picture of the story behind your work — and get the visibility and recognition you deserve (instead of working twice as hard to get half as far). What separates the people of color who get ahead from the ones who get benched? 90hr work weeks, missing out on time with your family, and a 4-day tension headache that starts every Sunday night? Selling your soul to the corporate machine and becoming a person you barely recognize just to fit in? Is it luck, natural charisma, or finally finding the perfect organization, the perfect manager, the perfect job? MASTER corporate politics and get things done in your organization — without selling your soul. BUILD strategic relationships and find mentors to help you get to the next level — even if networking freaks you out. CREATE your own opportunities to be seen and recognized for your work — instead of waiting for others to take notice. GATHER the constructive feedback you need to level-up — before you get left behind, wondering where you went wrong. POSITION yourself for your next big opportunity — like that juicy assignment, promotion, or project you've been eyeing. All you need to do is be willing to ask for help. We'll show you EXACTLY how to make it happen. A pay-as-you-go monthly membership that gives you access to insider coaching, training and support — to shorten your corporate learning curve, accelerate your success and navigate your workplace with unshakeable confidence. You'll also get INSTANT access to our exclusive on-demand training library, where you'll get a rapid education in EVERYTHING you need to thrive in your corporate career. Like Jana, who negotiated a 16% pay raise, a full professional development package and an additional $25,000 to her signing bonus. Like Felicia, who learned how to build relationships from scratch and leverage them into her dream job offer… without taking a single interview. Like Devon, who created a 90-day "slay" plan to rock any new organization, department or job — and quickly put himself on the map with key players, mentors and leaders in his company. Master corporate politics and get things done in your organization, without selling your soul. Career Risks: Are you playing it too safe? Network with confidence, and find mentors who will help you get to the nextAdd level. Gather and execute on the critical information you need to get noticed for your work & talents. Create opportunities for visibility and recognition - instead of waiting to get noticed. Ensure you're the "no-brainer" choice for opportunities and promotions. Because there is an art and a science to getting what you want at work — and we'll show you how to do it. EXPERT ROUNDTABLES - Each month we feature renowned experts and thought leaders to share their hard-won insights and advice via online webinar. At the end of the session, we'll open up the floor for Q&A time so you can learn from the best and overcome problems that others spend years trying to figure out on their own. "ASK ME ANYTHING" WEBINARS - Got a specific issue you want to troubleshoot? Bring your questions to our monthly "open forum" webinars to get one-on-one rapid-fire coaching from Deborah and experts in leadership, HR, negotiation, legal, branding and more. Can't make it there live? No problem. Simply send in your questions beforehand and check out the recording when it works for you. WORD-FOR-WORD SCRIPTS, GAMEPLANS AND TOOLS - Each month we'll send a done-for-you script, template or tool to help you execute and see results on the topic of the month. THE SITUATION ROOM - Join us inside The Situation Room to learn from a real world case study of a scenario that people of color frequently encounter in the workplace (like managing a hostile work environment, dealing with a disjointed or ineffective team, managerial issues and more). Together, we'll dissect how to handle challenging situations and what you can do differently to create win-win outcomes for everyone involved. We’ll also learn from success stories and share insights you can apply to your own career. See how others have created their own opportunities for visibility, how they got people on board with their ideas and more. We've got dozens of expert workshops already waiting for you to implement today — and the library is constantly growing. You may not like what she says, but if everyone in the corporate arena could be as straightforward and as truthful as she is, people would be a lot further along in their careers. I wish I had met Deborah 15 years ago. Earlier in my career, I can see there were many issues I waded in for too long. I've always been confident, but Deborah has taught me how to push the envelope a little more -- asking for those bigger projects, gathering and documenting feedback from my supervisor, finding opportunities for responsibility and visibility. She really takes the time to explore issues with you -- but at the same time, she will tell it to you like it is. You may not like what she says, but if everyone in the corporate arena could be as straightforward and as truthful as she is, people would be a lot further along in their careers. We believe that those small moments and daily interactions in the workplace can make or break a career. That's why we want to be there when you need us for those daily interactions, negotiations, slights, microagressions, tough moments and more. Post your questions, challenges and wins inside the Members Only Facebook Community and get the support you need — fast. Get support. Share your wins. And never go it alone again. 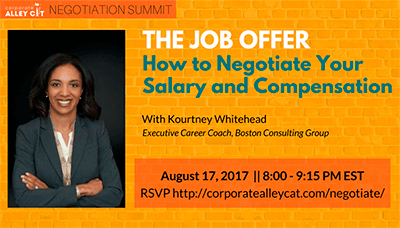 The Negotiation Summit ($147 value) - A crowd favorite from our virtual Negotiation Summit, this on-demand minicourse will walk you through the critical steps to take to negotiate your next raise. 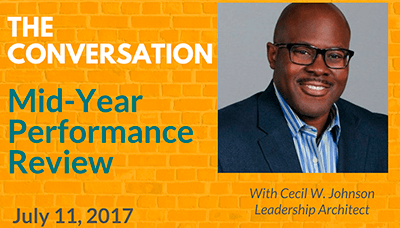 The Performance Review Summit ($147 value) - Take control of how you are perceived at work by mastering the performance conversation. This on-demand mini-course will show you how to navigate performance reviews and ensure your achievements are recognized at work. Enroll in The Alley before December 22 and choose the "yearly" option to get 3 MONTHS of rapid-fire coaching from Deborah and the Corporate Alley Cat Coaches. Deborah's guidance in building strategic relationships and creating a diverse network of mentors has been particularly valuable. My professional career has grown rapidly over the past couple of years, and I've found myself in new territory as a young leader. Deborah and The Corporate Alley Cat have helped me navigate those situations where I've been thrown in the deep-end and needed to quickly get up to speed. Deborah's guidance in building strategic relationships and creating a diverse network of mentors has been particularly valuable. She's been navigating this world for over 20 years... she just gets it. If we haven't met before, I'm Deborah Owens, Founder & CEO of Corporate Alley Cat: the go-to community for people of color in corporate America. As a seasoned sales leader and training executive with 20+ years of Fortune 100 business experience, I've been on the front lines of what people of color really experience in the workplace (and I’ve lived it myself). I've helped thousands of professionals of color overcome the challenges and capitalize on the opportunities they'll face throughout their careers. 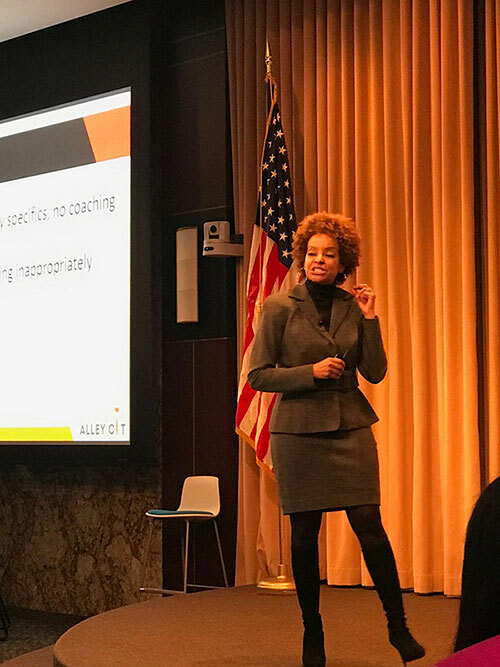 I've witnessed the transformation that occurs when people of color are resourced with the strategies and support they need to thrive in the workplace. People of color don't need more inspirational success stories and flashy conferences to get ahead. Because when the good vibes are gone, your binder from the event gets filed away, and you're back in the real world — what do you really need? Resources. In-the-moment support. And advice from someone who gets it. But when you want tactical, in the trenches advice for what you're up against today, where do you go? Maybe you turn to a group chat with your inner circle to strategize your next move and hope that their advice hits the mark. Maybe you hit up Google, Amazon and your podcast app to see what the internet has to say. And that's exactly why what we do here is less about career coaching and more about career activation. We want to make sure you have the right support and access to actionable strategies you can trust, exactly when you need it (along with valuable insights to help you avoid mistakes on the road ahead). 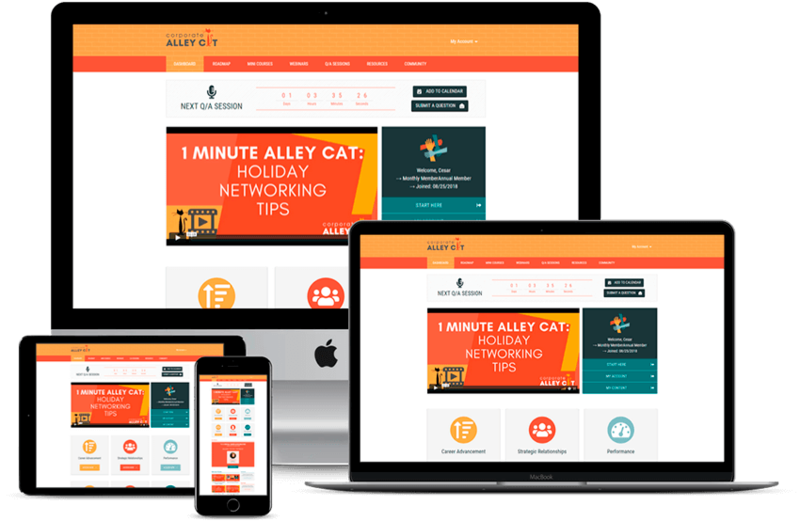 The official mission statement of Corporate Alley Cat is to change the experiences of people of color, one person at a time. It informs every conference, workshop and resource we develop for our audience of over 3000 professionals of color. Our ultimate goal is to provide you with the comprehensive, no-filler strategies you need to make waves — instead of struggling to keep your head above water (or winging it and hoping everything works out). That's why I'm so excited to share this opportunity with you today — and I look forward to the day when we'll be celebrating your success story, too. Guidance from mentors who get it and have been where you are to help you sidestep common career derailers and prevent workplace issues before they arise. 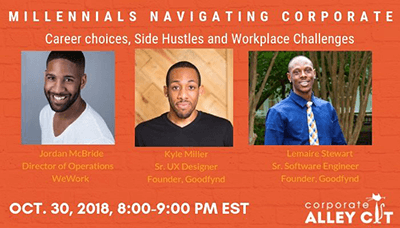 You're embarking on your corporate career and want to sidestep the stress and struggle by getting the go-to strategies, tools and advice you need to NAIL it right out of the gates. Your career is tracking along well, and you want to make sure you have access to the resources and feedback you need to stay ahead of the curve. You've got a big vision for your career and it's important that you don't get derailed by the roadblocks and challenges that lie ahead — and you want guidance from mentors who have successfully navigated the path you're headed down. You've been running on the corporate hamster wheel for years without much to show for it. You're ready to get more visible, get recognized for your efforts and carve out a career that doesn't drain you. You know what's not working in your career, but aren't sure how to fix it. You want to be resourced as you build critical skills in communication, relationship-building, negotiation and more — with a safe place to explore issues so you can execute with total confidence back at work. You're in a stage of transition: changing jobs, changing careers, or re-thinking how you want to show up and be seen at work. Maybe entrepreneurship has been on your mind. You want to make sure you have the resources you need to navigate this change skillfully — and land on your feet. You're cool with spending a short amount of focused time each week to develop yourself, your awareness and your skills — as long as it's time spent on actionable advice that you can implement for rapid results and high impact. You're sick of career advice that doesn't consider the nuanced needs of people in color and have struggled to find mentors who get you. You want relevant advice for the issues you're facing now — along with guidance for the road ahead to help you avoid painful mistakes and difficult situations. See yourself in ANY of the points above? The Alley was MADE for you, friend. You don't work in a corporate or professional role (or aren't looking to find one). You prefer career shortcuts over showing up and doing the work. Investing in yourself and your success isn't a priority. You can't handle the truth talk about how to adjust and adapt your own actions when required — even if it's exactly what you need to move forward. You don't want to be coached towards success and would prefer to "wing it" on your own. You aren't results-driven and relentlessly focused on delivering value in your organization. If you need to find a job tomorrow and you don't have the time to create a strategic and targeted plan that will maximize your opportunities. Because it is impossible to grow beyond yourself alone. But now that professionals of color have The Corporate Alley Cat, we don’t have to. In my first conversation with Deborah, I knew with my whole self that she was the coach and partner that I needed to shift myself out of career hell. She was very clear that she was not a Career Coach, but a Career Activator. The distinction between the two is just what I was looking for – concise, actionable growth within a given time period. I was beginning to feel excited about my career for the first time in a very, very long time. If you are at your career best, work with Deborah and stay that way. But, if you are where I was several months ago – Career Rock Bottom – invest, and work with Deborah. I want to join, but I'm B-U-S-Y with a capital B. How much time do I need? The structure of The Alley was created with busy professionals like you in mind. All of our workshops, resources and webinars are archived and recorded for you, ready for you to listen in when you're ready or on the go. Everything you'll find inside The Alley is action-focused — designed to be consumed in 30 minutes or less. And if you can't be at our live workshops, no problem! Just send in your questions ahead of time and catch the recordings later, our post your question in our private members-only community for quick feedback. ... Still don't think you have time? It is our PROMISE to spare you from fluff and platitudes that waste your valuable time, and we stand behind it with our 30-day guarantee (more on that below). 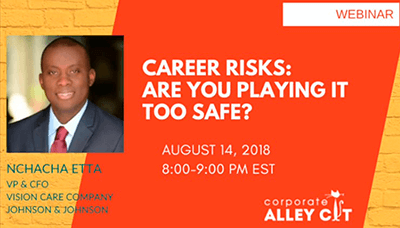 Is The Alley really for people of color at all stages of their corporate career? Yes! We've carefully planned out the resources inside The Alley to cater to the specific needs of people of color, no matter how far along they are in their corporate career. When you log into your membership dashboard, you'll see a "choose your own adventure" style menu that allows you to dive right into the resources that are relevant to your needs right now — and when you're ready to take it to the next level, know that everything you need is already waiting for you. Do I need to be a person of color to join The Alley? Non-professionals of color are welcome to join The Alley. However, although the issues we address are universal to some extent, we will be specifically addressing those issues through the lens of professionals of color. 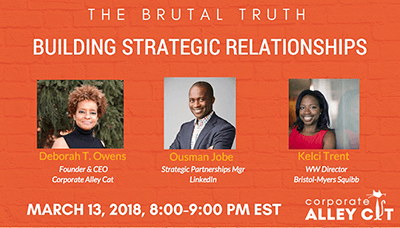 Resources and support for corporate professionals typically fail to consider the unique needs and experiences of professionals of color — and The Alley was created to fill this gap. What happens when I click the button to join? You'll be taken to a secure order form to enter your information and payment details. Within 15 minutes of your purchase, you'll receive an email with your login information to your private membership dashboard. Your first week of resources will be waiting for you, along with your library of on-demand expert workshops. How is this different to the other advice out there and the stuff I can get for free? I know that you've read the books, listened to the podcasts, and Googled your heart out in an attempt to get what you need to navigate the corporate arena. To put it bluntly… how's that been working for you? If you’re ready to break up with the "nice to know" advice and start getting the strategic "need to know" resources and support you've been looking for — relevant to you in a way that you've never experienced before — then The Alley is where you need to be. I already attend your free monthly webinars. Why should I pay to join The Alley? As of June 2018, we will only be offering one webinar per month to the public, and recordings will only be made available to members of The Alley. We want to be with you more than once a month — and people have told us they want more in-depth support than we can offer on a single webinar. That's why The Alley is all about giving the detailed strategies you need to execute flawlessly and with confidence. I hate networking and don't want to sell out to get ahead. Are you going to ask me to be someone I'm not? That's a big N-O. Even though professionals of color are implicitly expected to change who we are to fit in, this is soul-destroying. I know it. You know it. So let me say definitively that you DO NOT have to erase who you are in order to get ahead. Inside The Alley, you'll learn how to use your voice, your power and summon the courage to show up as your best, most compelling self — so you can get your needs met without attracting the unfair labels that are known to derail the careers of professionals of color. And as for the networking and charisma piece? It doesn't matter whether you think you're "a natural". If you're willing to embrace a little discomfort and let us support you in developing the skills you MUST master if you want to get ahead — and implement them with integrity — you'll see how amazing it feels to swap those fears for empowerment. Can you remind me what I'm get when I sign up? The Alley is a pay-as-you-go monthly membership that goes deep on specific topics relevant to professionals of color in corporate America. Think: networking, negotiation, managing bias in the workplace, and making strategic moves to advance your career and get your needs met (and that’s just for starters). Access to our Members Only Private Facebook community — to share your wins, struggles, and get answers to your questions between our live workshops. 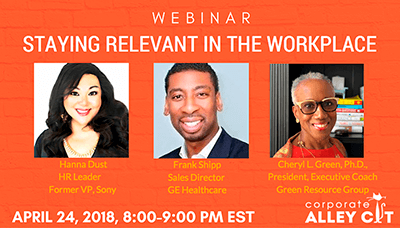 PLUS over 20 on-demand expert workshops lead by professionals of color and industry thought leaders on topics like negotiation, networking, managing workplace bias and more. Get instant access to these incredible resources and our VIP community at this low price! The "just wing it" approach to your career might be good enough today, but what is it really costing you? But your time is not a renewable resource. What happens when you wake up one morning and realize you're 1 year, 5 years, an entire decade behind where you thought you'd be from now? With a small but focused investment in yourself each week (just over a dollar a day), you can create the career and future you envision. It's life-changing. And that's why I want to make joining us inside The Alley the easiest executive decision you'll make all year. … Then all you need to do is email us within 30 days at support@corporatealleycat.com to receive a hassle-free refund of your money in full — so you can exit The Alley on good terms and get back to doing your thing. The Corporate Alley Cat saved my daughter's career. She was stuck in a rut -- working at a dead-end job that she hated in an uncomfortable and stressful environment. Ms Owens counseled her and placed her with a wonderful career coach who helped her figure out what she wanted to do and how to do it. She is now well on her way to starting her own business, which looks very promising. Most importantly, she is now happy, confident, motivated and excited about what the future holds. Thank you Corporate Alley Cat! This page is about to run out of pixels and I'm nearly all of out of words. - Negotiate the raise you've been meaning to ask for? - Curate your own inner-circle of peers, mentors and sponsors who have your back when you’re not in the room and scout killer opportunities for you? Hello dream job and real chances for advancement in your organization. - Access in-the-moment feedback from experts who’ve been in your shoes — so you can sidestep corporate BS and navigate your workplace with total confidence? Don't even ask me to quantify the value of your own wellbeing. ​How would it feel to walk into the office on Monday knowing that whatever gets thrown at you, The Alley’s got you covered? The only question left is: are you in? All it takes is the first step: to click that button, punch in your details and say YES to the support, strategies and insider information on offer to you today. We're here to help make sure you get it.